Bangladesh's war crimes tribunal, which is investigating the country's 1971 liberation struggle against Pakistan, has issued its first arrest warrants. 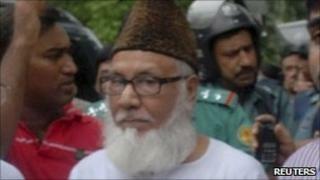 Court officials told the BBC the war crimes indictments targeted four leaders of Islamist political party Jamaat-e-Islami, already in custody. The tribunal was set up in March to try people accused of atrocities. Bangladesh was part of Pakistan until the nine-month war of secession, which left up to three million people dead. The four accused - Jamaat leader Motiur Rahman Nizami; his deputy Ali Ahsan Mohammad Mujahid; and two other senior leaders, Muhammad Kamaruzzaman and Abdul Quader Mollah - were detained last month on unrelated charges. A senior court official, Mohammed Shahinur Islam, told the BBC on Monday the four would not be able to apply for bail under Monday's warrants. Jamaat-e-Islami accuses the government of using war crimes charges to try to curb the opposition party's activities. The next hearing in the case will be on 2 August. The Awami League-led government set up the war crimes tribunal in March this year to investigate those Bangladeshis who, at the time, collaborated with Pakistani forces - and are accused of killing many civilians.